It is hard to be a proper lady. Or at least pretend to be one. I wore this to work and had a hard time walking, sitting and looking all proper. But it was all worth it when I received compliments. Of course, my friends were complimenting the clothes. Seriously, how not to love it? The maxi dress, worn as a skirt is a perfect layering piece to have under this very beautiful blouse. I knew I wanted to wear them together the minute it reached me. I am in love with the embroidery detail on this blouse. Such a pretty colour too! If you like what I am wearing and want it for yourself, go to ThePoplook.com now! It is free shipping to Brunei and Singapore now till 28th February 2013! You still have 6 days to make your purchases! I already have several items in my shopping cart. Go on now! hey just wanna know what size r u wearing for the top? very beautiful combination! its very ladylike and fashionable at the same time. i love how you added the belt! Love the outfit, the maxi dress and the blouse are so so beautiful! Haha, I think this is the first time I see you in a printed shawl. 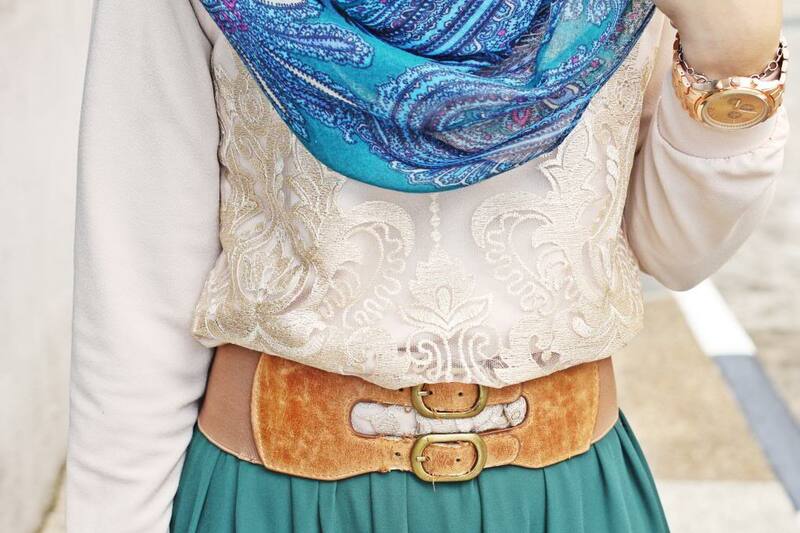 The entire outfit is absolutely lovely!